Some thoughts on the extension to the Yonge-University-Spadina (YUS) Line on the western branch (beginning from Downsview Station) which the TTC is currently building. They should build the new subway extensions to allow for cell use even if they are underground tunnels. To be clear, what I mean by that, is that they should allow for cell signals to be able to penetrate the underground tunnels – assuming it is feasible – by having shafts/grates above the tunnels to above ground to allow the signals to penetrate. This would mean a special network would not have to be built up below ground (at least for these new tunnels). 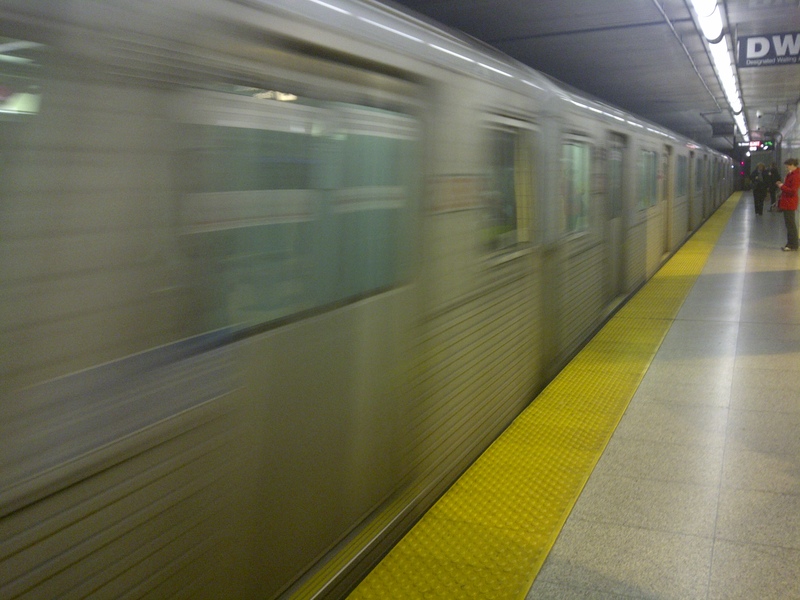 I went yesterday to see the “launch” of the new subway cars called, fittingly the ‘Toronto Rocket’. In the news recently has been talk of the TTC (Toronto Transit Commission) contemplating the sale of station & subway line naming rights to advertisers (see Torontoist’s article here). After that, Torontoist also came out with a joking new subway map which used all sorts of corporate and company names as part of the subway station names (see it here and here). A lot of people, as you can tell by those articles have ridiculed the idea of marring the naming of Toronto’s ‘beloved’ (OK, fine, ‘much maligned’ is more accurate) TTC system with names of companies instead of the names of stations or lines. However, as I have previously said they do need to do something to revamp the naming of stations and lines – I am not advocating for or against corporate sponsorship here – to make it easier to navigate in general. TTC, City of Toronto, here is my idea – instead of selling the naming rights how about we start allowing advertisers to put signs in special places on subway platforms and near exits of stations letting people know what is outside and where…just like on the exits of highways! 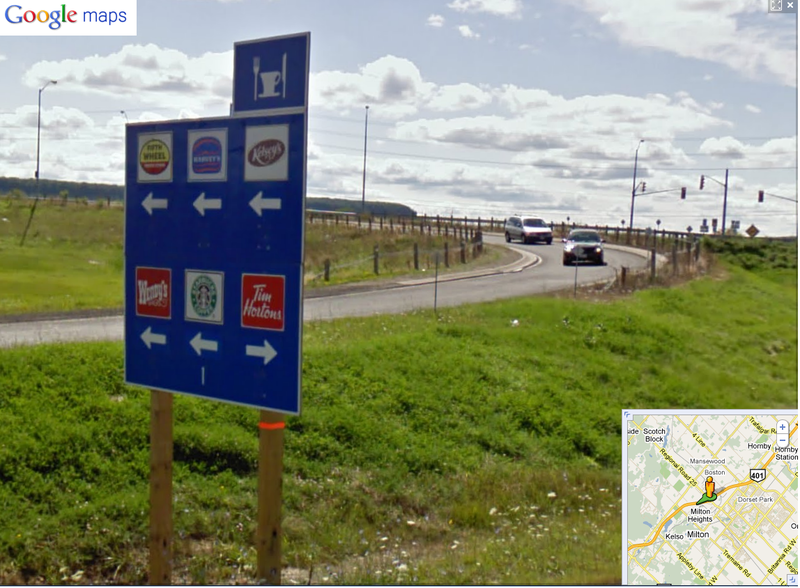 In case you don’t know what I mean I have included a picture I pulled from Google Maps Street View of Exit 320 of Highway 401 and posted it on the left. The sign tells me that at this stop there are places I can purchase food in this case the sign lists a Harvey’s, a Kelsey’s, a Starbucks, a Wendy’s and some place called Fifth Wheel Truck Stop if I turn left off the ramp and a Tim Hortons if I go right. Of course, what this sign doesn’t tell me (I assume because they aren’t paying for it) is that there is a McDonald’s closer to the highway (not by much but still) than the Harvey’s & Swiss Chalet and in the same plaza as those two there is also a Subway Restaurant. There are other versions of this sign which also tell me where they hotels/motels are at exits, where the gas stations are at exits and which exits have the interesting sights to see as well as where they are. These signs also exist (without the direction arrows) as you near the exit so you know to get over to the exit lane on the right and begin to salivate for the food, or check you gas gauge to see if you need to top up. Let’s tell advertisers that they we are putting something akin to those signs in the TTC stations on the platforms and near the exits. I don’t doubt retailers would pay a pretty penny for people to know there is one of their locations just outside the subway station. Yesterday’s Mystery Of The Strange Sign Outside St. George TTC Station: SOLVED!!! In yesterday’s blog post “Spotted: TTC Referring To Subway Lines By Color!” I mentioned (and showed a picture) of a strange sign outside of St George TTC Subway Station on Bedford Rd. This sign was like none I had ever seen before for the TTC referring to subway lines by colors and numbers. I hoped when I wrote it that it was the beginning of the TTC moving to adopt some signage that would be easier to understand for tourists or people new to the city. I found out to my chagrin after doing some searching that while I was sort of right I was mostly wrong. After some searching I found out this was a pilot project by the TTC to introduce a new type of signs to the subway/bus/RT system. However, this move was done in the mid 1990s and half of St George Station was the pilot/beta testing area of the proposed signs. As you already have guessed the TTC did not implement these signs anywhere else in the system either (otherwise it wouldn’t have struck me as remarkable). Well as I mentioned above and as you can see from the Google Maps StreetView imagery of the station (taken some time in 2009 and posted in 2009, but the copyright for it is from 2010) – this sign is not new. Also, as I mentioned above the sign is actually from the early 1990s: 1993 or 1994. You can check out more and better pictures of this sign along with the drawings/plans for the sign and comparisons to the ones they made instead in Joe Clark’s Flickr stream collection called “TTC pylon signs” here. Also, Joe Clark put up some another Flickr stream collection “Paul Arthur’s original signs at St. George station” here. 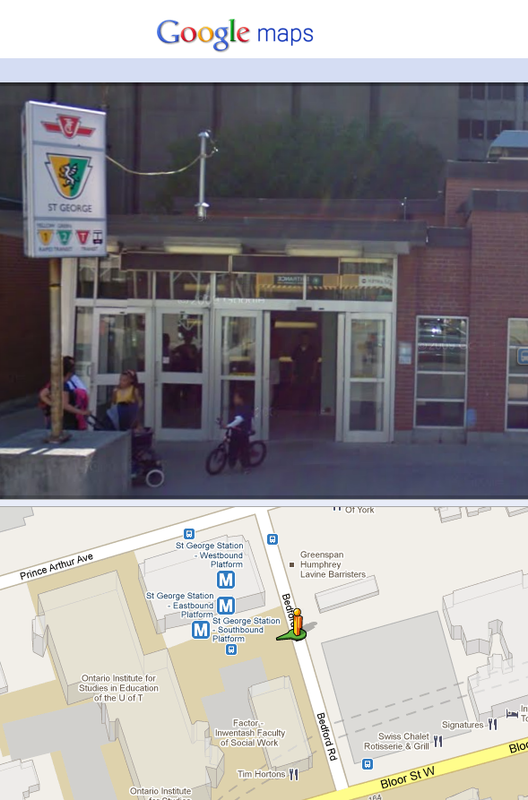 The second Flickr collection actually has pictures from circa 1993-94 of St George Station when not only did it have the strange sign that remains outside of the Bedford Rd entrance but they also had half of the subway station’s signs redesigned as part of the pilot program. In the end the TTC decided to go a different way and what remains is the bad signage we have still today in Toronto. However, the St George Station pilot program of the 1990s while it was a great idea wasn’t all roses. Below check out a picture from the second set which is owned by Joe Clark and taken from here. Joe Clark titled the photo “Line Map”. “Line Map” by Joe Clark “showed only stations it was possible to get to” from St George Subway Station in the Paul Arthur pilot signage program of the early 1990s which was never implemented in the rest of the system. This map was the one thing I really did not like about the sign pilot program of the 1990s. I don’t like it for a very different reason than someone reportedly complained about in the Toronto Life, the North-South axis was on a horizontal. Rather, my problem with it is that it tells the rider they are going to go south to Union but Union isn’t the end of the line in this map. Beyond that the line doesn’t pull a U-turn at Union Station as it does in real life rather it seems to go south all the way to Finch Station (which is really north of St George). Granted, they did try to note that Union is the southernmost tip of the line by putting an S underneath it but it isn’t very self explanatory for someone who doesn’t know the system or a map of Toronto. Beyond that, the Bloor Line (or here the Green/2 Line) seems to hit the 1/Yellow Line (really known as the Yonge-University-Spadina Line) with 11 stops in between. While this is technically true, you COULD ride the train all the way around Union to the other side of the Bloor Line why anyone in their right mind trying to actually get somewhere WOULD do that is beyond me. The other side of the Bloor Line is really 3 stops away from St George. This map makes it appear as if the Bloor Line is the one that has a giant U-shape and not the Yonge-University-Spadina Line. Further, the “Line Map” sign to me seems to have contradicted the “Decision Sign” which is above and you can find here and is also in Joe Clark’s Flickr stream collection “Paul Arthur’s original signs at St. George station” indicated that the end of the line was Union. If you looked at the “Line Map” (posted above the Decision Sign) the stations seemed to continue on past Union to Finch as I mentioned above. What was also strange about the Line Map is it didn’t tell you the names of the stations north of you…I am going to assume this was put on the southbound platform and the rationale was that if you’re on the southbound platform you don’t need to know the stations to the north of you and that does make sense but it still is a little bit odd to me, untrained in the art of sign making. If you want to know more about this sign pilot program check out Joe Clark’s postings on his website about it here – http://joeclark.org/design/signage/TTC/redesign/. It really is a pity that no one ever implemented the good parts of this plan. Hopefully, the TTC will get its act together sometime soon and put in signs that actually tell people what they need to know. Either way, I think that the sign outside St George Station on Beford Rd which is the most noticeable remnant – and possibly quite a confusing one – of the Paul Arthur signs from the 1990s should be taken down and preserved in a museum somewhere. 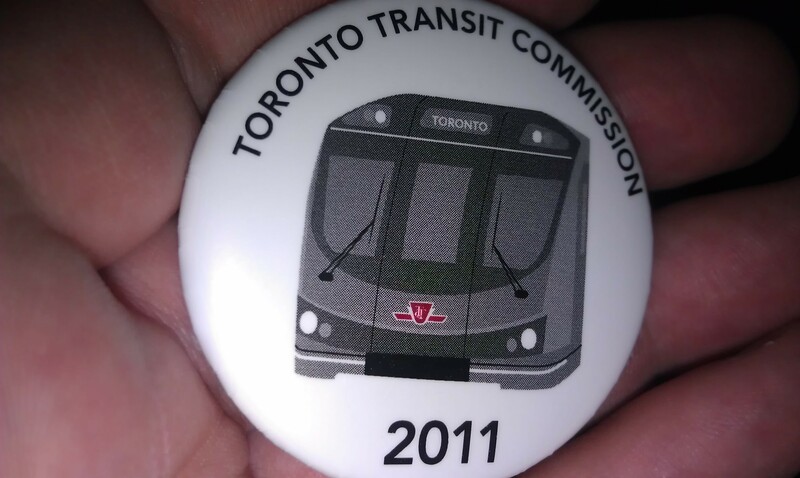 It serves no purpose in its current location other than confusion and wasting electricity but it is an important part of the TTC’s history which one day I hope they revisit and implement. Maybe before the 17th Pan American Games in 2015 (aka (Pan Am Games) when a whole bunch of international visitors from 41 countries all over the Americas will flock to Toronto. Spotted: TTC Referring To Subway Lines By Color! I just got into the TTC (Toronto Transit Commission) subway station called St. George Station on my way from the Rogers RedBoard 1st Birthday Party to my friend Kelly’s Birthday Celebration. In fact, I began writing this post on my phone while the subway was underground and I had no reception. More importantly, on the way into the station, a little bit north of the intersection of Bedford Rd. and Bloor St. on the west side of Bedford Rd. I saw the sign you see pictured above. 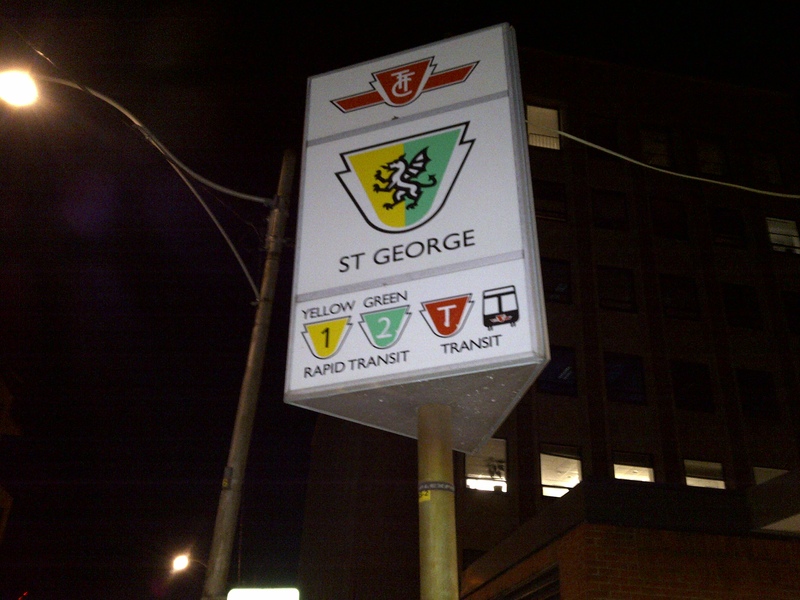 You can see how the sign refers to the two subway lines that intersect at St. George Station – a yellow shield with a 1 inside it labeled “Yellow” underneath and a green shield with a 2 inside it labeled “Green” underneath. I do not recall if I have mentioned this in this blog before but for a while I have been saying that the TTC should augment the names of their subway/RT lines by referring to them by color as well. 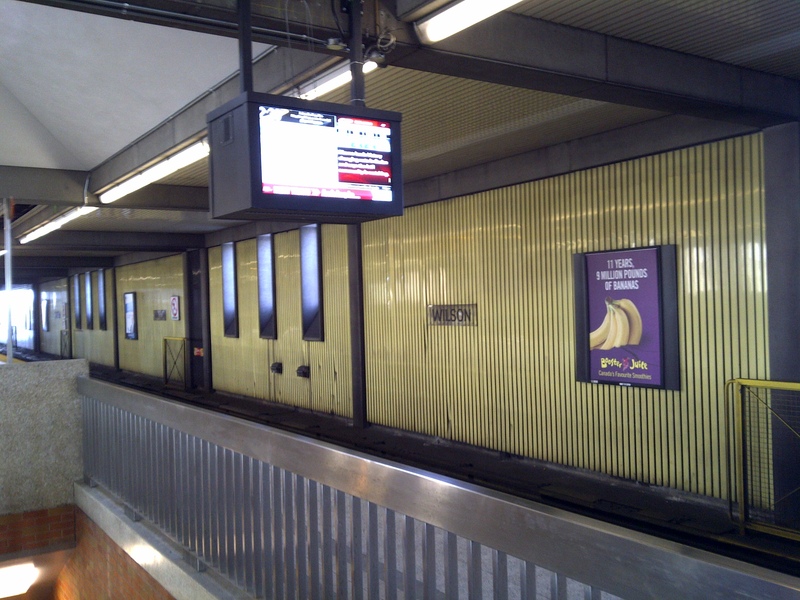 The Yonge-University-Spadina (YUS) line on subway maps is yellow, the Bloor line is green, the Scarborough RT line is blue, and the Sheppard line is purple. This is coloring is consistent across all TTC subway and TTC bus/streetcar route maps I have ever seen. If they did this I feel that it would make directions easier for tourists who don’t know street names in this city and therefore a name like the Bloor Line means next to nothing and is easy to forget. I also think that when/if the TTC does this they should split the coloring of the YUS line from a solid yellow to 2 colors. This would be to reflect the fact that it is actually in the shape of a “U” and that it can be easily seen as 2 lines running parallel to each other meeting at their southern ends. HOWEVER I have never seen anywhere where the TTC maps or any other TTC signage identify the subway lines by color. I also have definitely never seen anywhere where the TTC (or anyone else) identifies subway lines by number. Why then, would they put this sign outside St George station which doesn’t identify the lines inside it by name and instead does it by color and number? Although the color identification is sort of odd it makes a certain amount of sense as the subway lines are all colored the same on every map. This means that although most people do not refer to them by color, the color of each line is attached in our brains to the lines. But the numbers just make absolutely no sense. This has yet to happen to me but if a tourist (or someone new to the city) was ever to walk over to me – before I saw this sign and wrote a blog post about it – and asked me where they can find a subway station on the “Number One Line” I’d probably feel bad for them and just look at them confused. I would probably assume someone had given them REALLY bad directions or was playing a prank on them and ask them for the address/venue they were trying to reach and hope I could help them that way. Have you ever seen anywhere else in Toronto where the subway lines are OFFICIALLY referred to this way (by color or by number)? Do you like my naming of the subway lines augmented OFFICIALLY by designated them by colors idea? Do you like my idea to split the coloring of the YUS Line into 2 separate colors meeting at the bottom? Do you agree with me that it would probably make the transit system easier to navigate for tourists and people who’ve newly moved to the city? Stop Whining, Rob Ford Isn’t Even Mayor Yet! This was a post I wrote when replying to a friend on Facebook’s posting of a Miami, FL newspaper article. The paper was making fun of the newly elected Mayor of Toronto, Rob Ford. It is quite irrelevant who I voted for, or if I even voted for the purposes of my post. The discussion being had by the people on Facebook posting underneath the article, all around Downtown Toronto, and all over Twitter was that Rob Ford is a fool and makes idiotic statements. Well, I have news for you, no business really cares about who the mayor in terms of if he makes idiotic remarks. A business isn’t going to make a decision to headquarter in a city based on the fact that the mayor once smoked pot & says stupid things from time to time. Give a city high business taxes, high airport taxes, high property taxes, an extra tax just for owning a car & terrible public transit/infrastructure (aka TORONTO now) and a business is NOT going to locate in that city. How cheap is it to come to the city? Well Toronto has one of the most expensive airports to land a plane IN THE WORLD making airfare here MUCH more expensive. How can the tourist get around in the city? Take a cab or rent a car because if you want to actually see the city our transit system goes nowhere, is confusing, is expensive, is unreliable, is stuck in the 1970s technologically, where there are signs they are confusing or uninformative, and its employees have never heard the words Customer Service. People come to Toronto and laugh at the ridiculousness of the transit system for a city this size. This past Saturday night it took me NINETY MINUTES at 2am on an OVERFLOWING bus up Yonge to get from Adelaide & Yonge to Wilson Station area – that’s almost triple the time a subway ride would take. People think of moving to the city and decide against it due to the high taxes and some of the worst traffic in the world coupled with the longest on average commute in the world. Businesses choose to locate elsewhere for the same reasons. When Mel Lastman was the Mayor of Toronto he ran his mouth a bunch of times and said stupid things. Even still there was a reason he was re-elected with 80% of the vote in 2000 after only narrowly defeating Barbara Hall in 1997. Compare that to David Miller who beat Jon Tory by a less narrow margin of 43% to 38% and then got re-elected with 50% of the vote (only a 7% increase). I would think most of us would agree that David Miller is a much more polished individual when compared to Mel Lastman. People care about results. If Rob Ford wants to be a mayor like Mel Lastman in the colorfully quotable department; and he remains transparent, tames the unions and spending, and lowers taxes nobody is going to care or even really remember the idiotic quotes. He will be remembered as making this truly a “City That Works” as it was dubbed by Anthony Astrachan in 1975. (Who knows, maybe it did “work” then). At this point stop your complaining. Rob Ford has been elected, DEAL WITH IT! The fact is, Rob Ford is not even in the mayor’s office yet. He has yet to actually do anything as mayor so you really have NOTHING to whine about. Judge him on his actions and his decisions in office and their results, they’ll speak louder than his words. I have lived in Toronto for many, many years and I have never once heard it called that. Urban, city, and town planning integrates land use planning and transport planning to improve the built, economic and social environments of communities. REEEEEEEEAALLY??? Toronto has successfully integrated its transport planning? I have to wonder if Jane Jacobs or anyone else who calls it The City That Works ever actually tried to get somewhere on the TTC (Toronto Transit Commission). Ever try to get home quickly on a cold winter night after being out after 1:45 am? (Did I mention that last call is 1:45am, bars stop serving alcohol at 2am, and most close at 2:30am) You can’t because the last trains north out of Union Station leave at 1:42am! That means you have to sit and wait for the bus which only comes every half an hour and woe be the person who needs to take a bus and connect to another one after that at night! A trip which on the subway wouldn’t even take 25 minutes could easily take more than 2 hours! You want to discourage drunk driving? Run the subway in sync with the bars & clubs! The City That Works, HA!